Everest Base Camp Trekking is popular as a world brand adventure to the highest base of the world, Mt. Everest Base Camp (5354m). Everest Base Camp Trekking is rated as moderate to challenging to the trekkers. There is no age restriction for this trekking but recommended for the people of 14-65. The adventure enthusiasts across the world have dream to pursue Everest Base Camp and also Everest Base Camp is listed as one of the Top Ten must visit destinations of the world. The primary highlights of Everest Base Camp Trekking are scenic flights from Kathmandu to Lukla, Lukla Airport, Sagarmatha National Park, Namche Bazar, Tengboche Monastery, Kalapatthar, Everest Base Camp, breathtaking mountain views and Sherpa people and culture. These highlights are explained in details below. Before starting our Everest Base Camp Trekking, we require to take a short flight to Lukla frpm Kathmandu. This flight will be magnificent to view stunning Himalayan panorama including Langtang and Everest. The Katmandu valley, landscapes, the settlements etc are beautiful to see from this smaller plane with maximum 19 seats. The flight takes 35 minutes to get Lukla. Lukla Airport is also known as Tenjing – Hillary Airport. This airport is recognized as the most dangerous airport of the world. The airport is located in the lap of mountain in Lukla town. The weather of Lukla airport constantly changes. So that the flights from Kathmandu, frequently, have to be either postponed and delayed. Those who are preparing to do Everest Base Camp Trekking are recommended to have some spare days in case the flight is disturbed. We explore Lukla airport for few minutes and head to Phakding with our crew. We enter into Sagarmatha National Park from Manjo. We can buy our National Park Entry Permit at Monjo but we suggest getting it Kathmandu. Your trekking partner will arrange it for you. Sgarmatha National Park Entry Permit costs USD 30. We experience lush forest like pine, juniper, rhododendron and other alpine vegetations during our trek in Sagarmatha National Park. The core wilderness into the wild National Park will be astonishing experience. At the same time, we can experience blue sheep, yak, snow leopard and other many species of wildlife. This diverse species of flora and faunas makes Sagarmatha National Park distinctive from other national parks in the world. Also, Sgarmatha National Park is popular as the national park located at the highest elevation in the world. Namche Bazaar is the center attraction of Everest Base Camp where we acclimatize. During our acclimatization at Namche, we explore Tibetan market, Sherpa Cultural Museum, beautiful settlement of Namche Bazar and hike up to Hotel Everest View and enjoy spectacular Khumjung village and mountain panorama including Mt. Everest, the top of the world. We also enjoy the beautiful Amadablam from Namche Bazar. The availability of internet, Wi-Fi, cozy restaurants and hotels make this acclimatization more relaxed. Tengboche Monstery is located in Tengboche in Sagarmatha National Park. Tengboche Monsatery owns its unique space in Everest Base Camp Trekking as the oldest monastery in Everest region. The monastery is located in the serene atmosphere of Tegboche town. The monastery offers us an opportunity to view entire Sagarmatha National Park. The stay at Tengboche soothes and relaxes us. Kalapatthar is the best vantage point in Everest Base Camp Trekking. We climb Kalapatthar from Gorekhshep early in the morning before sunrise. It takes about an hour to get the top of the hillock facing directly to Pumori. We celebrate astonishing views of sunrise and mountain summits include Loa Tse, Nupse, Pumori and Mt. Everest, the top of the world. 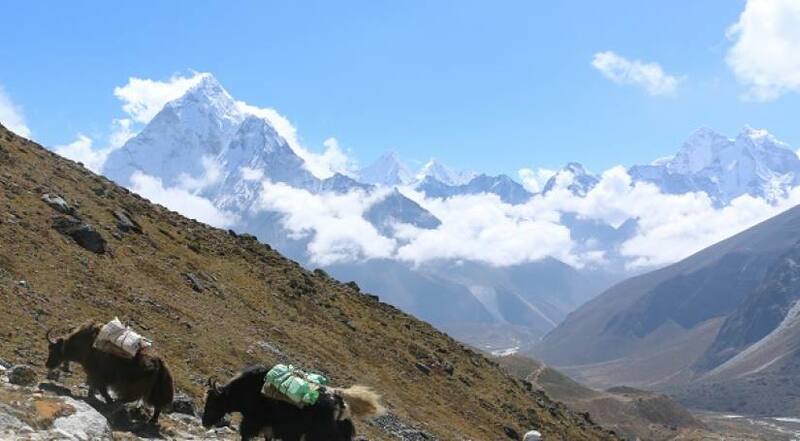 From Gorekh Shep, we further trek to Everest Base Camp, the world highest base camp and capture magnificent views of mountain giants towering in the sky. We also view mighty glaciers and avalanches from Everest Base Camp. Everest region is abode to Sherpa people who are known as climbers. They are rich in culture and civilization. Buddhism is the major religious practice among these people. We can observe magnificent rituals, rites and festivals during our visit to Everest Base Camp. At the same time, we taste the flavor of organic and local food items of Sherpa people. The views of Everest, Nuptse and Changtse, Lhotse, Pumori and Amadablam are spectacular during our Everest Base Camp Trekking. Thus, do not miss to experience the above mentioned highlights of Everest Base Camp Trekking. Otherwise, you adventure trekking will be incomplete.